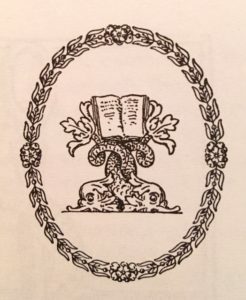 Like Aldus Manutius, the fifteenth century Venetian printer, Thomas Bird Mosher entered the publishing world late in life. Mosher was thirty-nine when he embarked upon his career as publisher and editor. 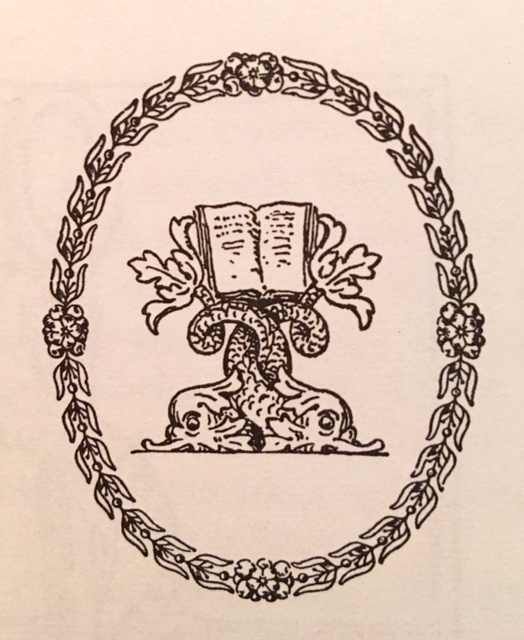 Also like Aldus he produced small, finely printed books at a reasonable price affordable by the middle class. 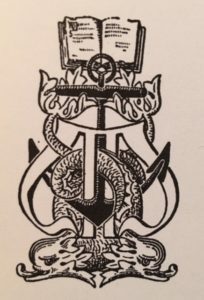 Unlike Aldus, however, whose book designs and contents were often stolen by other printers, Mosher himself became notorious as the impassioned “Portland Pirate” of the turn-of-the-century printing world. 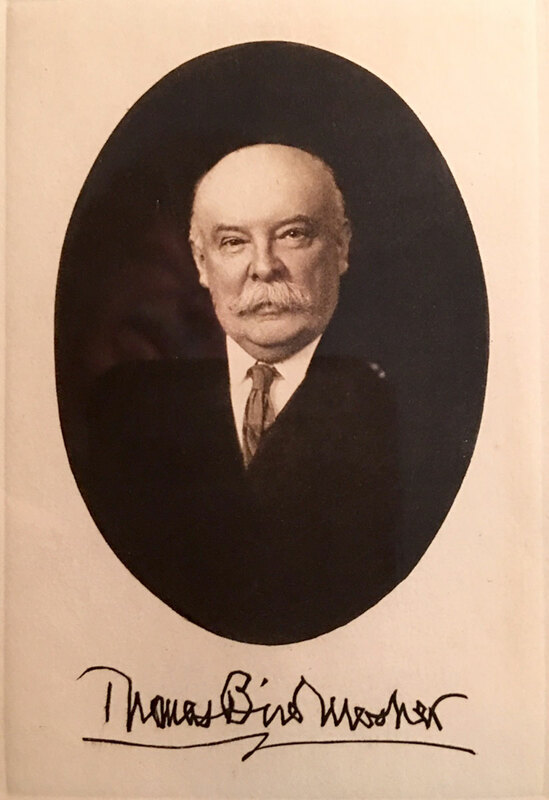 He was born in 1852 in Biddeford, Maine, the son of Captain Benjamin Mosher, a skipper in the China trade, and Mary Elizabeth Merrill. The Mosher family had deep roots in Maine, having settled there in the middle of the seventeenth century. Mosher’s parents saw to his early education in Boston, and his mother kept him supplied with numerous magazines, dime novels, and other popular publication to support his voracious appetite for reading. 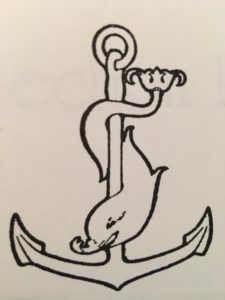 Mosher’s formal education was limited to graduating from the Quincy Grammar School at twelve and reading under the supervision of a local Biddeford minister; however, he acquired an extensive informal education during several seafaring voyages aboard his father’s vessels. Trips to Liverpool and even to New Orleans on the Civil War troop transport, the De Witt Clinton, were propaedeutic to the now legendary 1866-1870 family tour aboard the clipper Nor’wester, when Mosher was but a lad of fourteen. No! I shall never again read books as I once read them in my early seafaring when all the world and love were young! Nor shall I ever forget those days of tropical splendor, or nights when only a faint and oily lamp swung in the lonely cabin; the plunging ship midst ocean’s gray and solitary waste, and the long wintry passage around Cape Horn. One would think that a three-and-a-half-year world voyage to England, Europe, South America, San Francisco, and Puget Sound, to the mysterious Pacific Islands, and four times past Cape Horn would fill a traveler’s head with the rich experience of a Melville, a Dana, or a Masefield, but not so with Mosher. Often, while his sister Elizabeth was topside, excitedly drinking in the sights, Tom’s nose was buried in a book below the deck. 1 Cast away were any hopes that Captain Mosher might have entertained for his son to see something of the world and to be made a man by the sea’s discipline. Instead, Tom busied himself with a daily regimen of study and exercise, both of the mind and the body. He apparently took little note of the world about him, focusing instead on the book before him or attending to the “readings” of his own inner world. In 1870, with the world of sea travel behind him, Mosher sallied into a different world of high and rough romantic seas. It was shortly after his return that another try at formal education ended almost as quickly as it began at the Phillips Exeter Academy in Andover, Massachusetts. Soon after this aborted attempt, Mosher began courting a hometown girl, Ellen S. Dresser. The two became romantically involved, so much so that in June 1871 they eloped. They tried to keep their marriage a secret, but when Tom was discovered late at night in Ellie’s bedroom, they were forced by their somewhat disgruntled families to make the union formal and public on July 4. Any hopes for further schooling were dashed when his father demanded that Tom leave the Biddeford home to take up the adult responsibilities of work and running his own household. 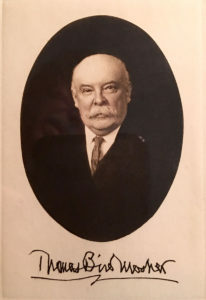 As a result, Tom Mosher began his first employment as a clerk with his wife’s uncle at the stationery firm of Dresser, McClellan and Company in Portland, Maine. A remarkable set of failures punctuated the next twenty years. Mosher soon quit his position. He tried working in bookshops and selling printing supplies and equipment in New York City and Philadelphia, and even landed a position as a clerk in a St. Louis bookstore, which he held for two years. While all these dead ends were piling up, his wife suffered a miscarriage. After several stressful years, she abandoned him in the fall of 1879. The 1880’s were marked for Mosher by a series of sorrowful events. In 1879 his dearest friend and literary soul mate, Leopold Lobsitz, suffered an untimely death while attending Harvard Medical School. Three years later the divorce took place, followed in 1884 by the death of Mosher’s old friend and employer, Aurin Dresser, and in 1885 by that of his father. The attempt to revive Dresser’s law book and stationery business under the name of McClellan, Mosher and Company ended in bankruptcy around 1889. Yet Mosher’s life had its joys and accomplishments. He wrote poetry and articles for New England periodicals and newspapers (using his dead uncle’s name, Richard Merrill, as a nom de plume) and a preface for A Brief History of Maine, published in 1888 by McClellan, Mosher and Company. He also managed to build a sizable library 2 and had become familiar with the intricacies of printing and binding. Furthermore, Mosher resurrected a business out of the ashes of the bankruptcy. The Thomas B. Mosher Company, a wholesale stationers’ business, manufactured lithographs and legal blank books and sold law books. The income from this venture allow him to begin publishing literary works, his true love. In October 1891, Mosher published George Meredith’s Modern Love (see reviews ), a book ignored by other American and English publishers. Next to appear, in 1892 (the year of his second marriage, to Anna M. Littlefield), was The City of Dreadful Night by James Thompson. These first two publication did not meet with great success, but Mosher had begun to establish his trademark style of bookmaking, and the pace of his publishing quickened. In 1893 two books were published, followed by two more books and his first catalogue in 1894. In 1895 the first issue of his magazine, The Bibelot, appeared, along with eight additional books. By 1898 thirty-nine publication had firmly established Mosher’s name and reputation. Part of the credit for the fame and successful dissemination of the Mosher books rests on his piracy of English authors. The international copyright laws of 1872 [and 1891] were still misunderstood and commonly flouted. If foreign publishers neglected to issue an American edition of their book, that book became fair game for American publishers. When Mosher published works that had no American edition, without authorization from either author or publisher, he was acting legally but broke the customary, extralegal right of prior publication —hence the controversy. Articles attacking his methods, such as “Thomas B. Mosher, The American Book Pirate: A Warning to Booksellers,” 3 and “The Methods of Mosher,” 4 appeared in a variety of English and American periodicals between 1896 and 1914. Although Mosher defended himself vigorously against these accusations, he was not unhappy with the controversy, since instead of putting an end to the Mosher Books it gave them free publicity, thereby increasing his notoriety and the sale of his books. Mosher’s publishing career extended over thirty-three years. During that time he personally supervised an enormous output of over 700 books (multiple editions included) covering over 400 titles. He chose the papers, selected the typefaces and page arrangements, and followed the books’ production from start to finish, all the while publishing “only the things I love, and desire other to love.” He introduced the American public to the riches of the Irish Revival, the English Aesthetes, the French Symbolists, and many forgotten ancient and medieval texts. The American public had Mosher to praise for many fine literary introductions, but it is a pity that he failed to introduce two of America’s own. The young Robert Frost was a good friend but could not coax Mosher into publishing his books. Another young poet, Ezra Pound, was equally unsuccessful. 5 These authors’ desire to have their works become Mosher books speaks of the high regard many held for the books from Portland. In many respects Mosher was a peculiar fellow. He sailed the world’s seas for over three years but spent much of that time reading or, while ashore, visiting bookshops (or frequenting graveyards to read tombstone epitaphs). 6 He lived and worked in Portland, but few locals even knew he existed. For the most part, he eschewed close contact with the members of the Boston printing renaissance. He befriended very few people and seemed to prefer conducting intense friendships via correspondence rather than in person. He enjoyed Epicurean fare during his travels yet bought his groceries out of town so as to avoid local contacts. 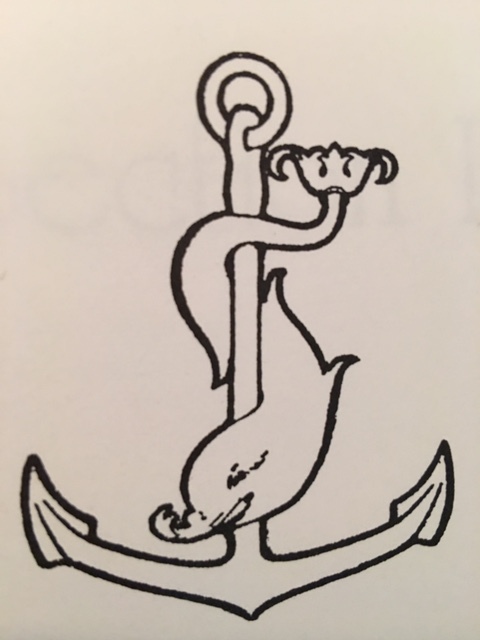 The man of refined literary taste enjoyed racy stories and showed his swashbuckling side to intimates, admitting that the things he liked most were “blue china, poetry, and the smell of women offshore,” adding that his only regret in life was to have missed two hangings because his father would not allow him to go ashore. In short, he was an eccentric. Norman Strouse points out that amid an American society with an intense drive toward mechanization and mass production, “there have been those who have found a way to live quiet and modestly successful lives while seeming to defy the normal rules for success… These seemingly eccentric individuals have been found living in places quite isolated from our vast centers of population, and though only one in ten thousand may ever have heard of them, they have provided a singular and permanent leaven in our cultural life. 7 Such a man was Mosher. The above biographical sketch appears as the first chapter in Vilain and Bishop’s Thomas Bird Mosher and the Art of the Book. Philadelphia, PA: F. A. Davis Company, 1992, pp. 1-4, and is used with the publisher’s kind permission. Interview with Elizabeth (Mosher) Cowan, in preliminary chapter of Dan Yorke’s That Man Mosher, Biddeford, Maine, unpublished, ca 1942, p. 22. 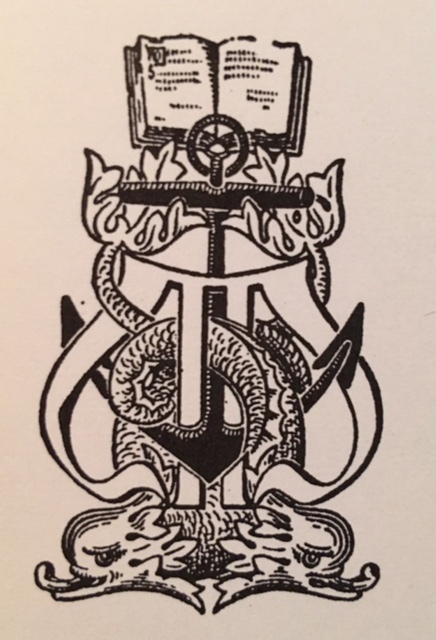 In 1897 Mosher commissioned a bookplate from Frank R. Rathbun of Auburn, New York; two double-breasted griffins facing one another and framing two dolphins holding a book. The original plate, printed on Japan vellum, was part of an exhibit of bookplates from the collection of the Club of Odd Volumes at the Museum of Fine Arts in Boston in 1898. The Publisher’s Circular, January 23, 1909. Ibid, June 6, 1909. Other articles appeared in such publications as The Critic (New York), The Glasgow Herald, The Manchester Guardian, The Academy, and The Literary Digest, to name must a few. Thomas A. Goldwasser. “Ezra Pound’A Lume Spento: A Preliminary Census.” The Papers of the Bibliographical Society of America, Vol. 83 (March 1989); pp. 18, 21, 30-31. Norman H. Strouse, The Passionate Pirate. North Hills, PA: Bird & Bull Press, 1963, p. 14.